Twelve days ago Snow White's Scary Adventures at the Magic Kingdom in Walt Disney World was closed forever. It seems almost surreal to think that it no longer exists, and that by now the process of gutting the building is well underway. I have yet to see anything show up on Ebay, but that can't be far away. As a matter of fact, I did leave my business card with the folks at Theme Park Connection in case they should happen to acquire any items from inside the ride. In any case, enough time had passed that we figured we should take Ben to the park and let him see with his own eyes that the ride is really gone. The weather in Central Florida has been miserable pretty much all week. It's nice enough in the morning, but by mid-afternoon the storms start sweeping through. I'm a Seattle boy, born and raised, so rain doesn't bother me much. As for Ben, I sometimes wonder if he even notices something as trivial as the weather. Thursday was the last day of school, and so I had him here at the house all day on Friday while I was working in my home office. By the time I had enough done that I could get away the weather was too miserable even for a soggy-friendly Washingtonian like me. Ben had been asking to "take a tram" (that's Ben speak for going to the Magic Kingdom) all day on Friday, and I promised him that on Saturday we would go. By late morning on Saturday Ben was nagging me constantly - "Daddy... I want... take-a-tram! Go see... Tinkerbell..."
We loaded up our gear and headed out. It wasn't raining yet but the sky was certainly making threatening overtures by the time we arrived at the Zurg parking lot and started walking in to the Ticket and Transportation Center. So far, Ben had not mentioned Snow White at all. Everything was "take-a-tram", "Tinkerbell", and "Fantasia", and so I was not surprised when he led me to the resort monorail instead of the express to the Magic Kingdom. The last few years he has taken a real liking to the Fantasia store inside the Contemporary hotel. Honestly, what's not to love? It's a free-standing store that can be seen from above on the monorail with giant mouse ears for an entrance, and the top shelves all around the store have maquettes of the enchanted brooms from Fantasia carrying their water buckets. Ben spent a fair amount of time taking pictures of those brooms, as well as a few pins and various other merchandise, and then he did something brand new -- he led me out the back of the hotel and over to the pool area. As we walked away from the pool, that's when Ben finally turned to me and said the words I was dreading: "More Snow White, please!" The drizzle slowly increased to a steady rainfall as we walked the pathway from the Contemporary to the Magic Kingdom. For the entire walk I reminded Ben that Snow White was closed, all gone. We could go see Pooh... Tomorrowland (Ben short-code for the Tomorrowland Transit Authority)... Pirates.... Still Ben looked up at me with a slight desperation in his eyes and repeated "More Snow White, please!" We were thoroughly sodden by the time we got through the turnstiles. Ben's mom met us at the park, on the theory that it would be best if we were both there with him the first time he came face to face with the construction walls. He walked up Main Street like a man on a mission, first walking through the Main Street Confectionery but hardly giving anything a glance, and then he was up into the Hub and angling to the right towards Cosmic Ray's. Then a sharp left up the pathway past the Wishing Well and in moments we were in Fantasyland. As usual he went right into the gift shop adjacent to SWSA, and that is when he encountered the first blow to his system - the doorway that he would normally exit through, which would lead him to the alternate entrance to SWSA, was closed and barred. He stopped dead in his tracks and tilted his head as he considered this oddity, and then cut out the side door to go around. That is when he came full face to the giant blue wall that had been erected around his favorite place in the world. He glanced up and I saw him notice that even the name of the ride was gone from the still-visible structure above the walls. 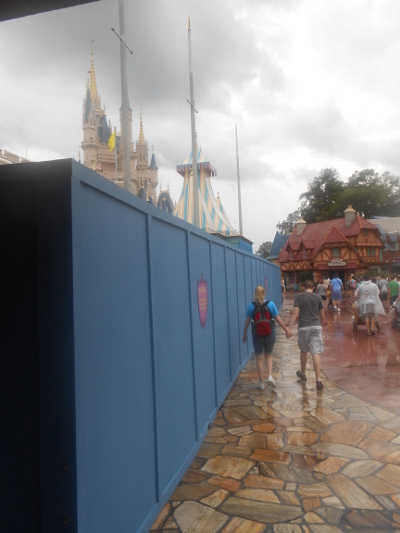 He walked the entire length of the wall, all the way to the Seven Dwarfs Mine shop, and followed the wall around into the dim back corner where the featureless blue barrier came to an end. He searched for a door there, to no avail. All the while his mother and I explained to him gently that Snow White was closed, that it was all gone. He took his mother's hand and then trudged back along the wall in the drizzling rain, still searching for a way in. The good news is he did not have a meltdown. I was genuinely worried that he would get upset and frustrated when he discovered his ride was really gone, but he stayed surprisingly calm. He went back into the gift shop and looked at the closed door a little longer, and for just a moment he looked like he was going to tip over the edge. Then he took out his camera, and focused on a tiny plush Sorcerer Mickey doll instead and took its picture. A few more snaps, then in a dejected whisper he said, "Monorail." So that was pretty much the entire visit. No tears, no inappropriate vocalizations, no hitting or kicking, just a subdued walk back out of the park. Honestly, I am happy to take that for the win. To my eyes he had a very normal sad response to seeing his favorite place shuttered up, and although it broke my heart it also kind of made me proud to see him process his disappointment in an appropriate way. I think we probably won't be going much this summer, but then again he may surprise me. We'll see. We could all learn from Ben on this one. Here's hoping he enjoy's many more visits to the Kingdom and finds a replacement to this attraction. We'll all miss it but time marches forward and the fine folks at Disney keep advancig right along. Excellent story, my heart goes out to you on this one. I have thoroughly enjoyed reading your blog posts about your son. Our 20 year old son has a lot in common with Ben and I could personally relate to so much of what you described. I have enjoyed reading Ben's story and I look forward to hearing more about Ben and what he thinks of all the new Fantasyland things.